Kington Tourist Information Centre is manned by an enthusiastic group of volunteers belonging to the Kington Tourist Group who provide information on Kington and the surrounding countryside and What's On in the area. Kington is an historic market town on the English/Welsh border, and though on the western side of Offa's Dyke, it has been an English town for a thousand years. The place-name Kington is recorded in 1086 in Domesday as Chingtune, its meaning commemorates a royal manor. 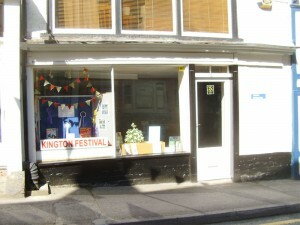 The Tourist Information Centre is to be found at 5 Church Street, Kington and is staffed from Easter to October. During the rest of the year local information can be found here at www.kingtontourist.info and any telephone query (01544 230778) left on the answering machine, email or letter will be answered quickly. A selection of leaflets can be found at St Mary's Church, Kington during the winter months. Go to our What's On calendar for events happening in and around the town. The town still has a regular livestock market, weekly Country Market and regular Local Food and Craft Market and monthly Art, Craft and Vintage Market plus the popular Festive Food from the Borders at the beginning of December to kick off the festive season and a Summer Food Fair in June. Details of the markets can be found on our calendar page What's On. Kington possesses a most attractive riverside recreation ground which houses the town's cricket club and is the venue for many local outdoor events. Kington Golf Club's 18-hole course on Bradnor Hill is said to be the highest in England, over 390 metres above sea level. It is a "Border Town" in the Marches in an area where it rightly claims to be a centre for walking and hosts it's own annual walking festival Kington Walks in September. New for 2018 the Spring Walking Festival 20th-22nd April. The local countryside can also offer quiet country lanes for those visitors who prefer to cycle. The west end of Kington is dominated by the tall clock tower commemorating Queen Victoria's Golden Jubilee in 1887. Adjacent to this is Kington's Museum. Standing high on a hill overlooking Kington is St. Mary's Church, for services and other local churches click here. On the edge of Kington can be found Hergest Croft Gardens where you can enjoy naturally landscaped gardens with two national collections of trees. You can also visit The Small Breeds Farm Park and Owl Centre at Kingswood, Kington. Although the town was supported by an earthen motte and bailey castle about this time, the main centre of importance was nearby Huntington with its protecting solid stone castle: indeed, from 1270 Kington was registered in the Hundred of Huntington. However, the commercial strength of Kington with its eight annual fairs, situated on the direct route of the drovers road winding eastwards over Hergest Ridge, saw the growth of Kington as the main market town in the area, and the gradual decline of Huntington. Present Kington, situated in the valley of the River Arrow, was originally called Kyneton in the Fields by the inhabitants of Old Kington who dwelt around Castle Hill and on Church Bank. It is possible that this 13th century settlement was built on land initially designated for the Saxon Three Field or Open Field System. New Kington still retains its medieval grid pattern of streets and back lanes which can be explored and enjoyed.. Aspects of the Industrial Revolution increased the significance of Kington: the building of the horse drawn tramway linking the Brecon Canal with Kington in 1820 and later the lime works at Burlingjobb to the west of the town; the foundation of Meredith's Iron Foundry in the opening years of the 19th century; and the coming of the railway in 1857, all increased the growth and importance of the town. You can discover much of Kington's past by visiting the Kington Museum, by following "Ken Reeves Walks" which look at the present buildings and record something of their past history or by a walk round Kington looking at 6 bronze plaques (shown on the map, and in "Kington Past" a new leaflet) which explains some of the aspects of the town's development. If you have time and transport you can find within easy reach of Kington Iron Age Hill Forts, a Stone Age Burial Chamber, Castles, a Cathedral, an Abbey, museums, a selection of churches of different ages and styles, historic houses and some ancient battlefields. This website is provided as a service and all information shown herein is subject to change at any time without notice. If you are in any doubt as to the information provided on the site, we recommend that you contact us directly or those third parties whose information is included here. Whilst we have taken every reasonable care in the preparation of the content of this website, we do not accept any liability for any errors or omissions. We do not accept any liability for any errors in data transmission, machine, software or operating error or any other cause. We do not make any representations as to the availability, suitability, reliability or otherwise of this website nor do we accept any liability for any loss whatsoever arising out of your use of this website or its content. This website may contain links to other websites and material produced by third parties . These links and material are provided for general information purposes only and the sites concerned are not endorsed or promoted by us in any way. We do not accept liability in relation to any materials or information on websites that are not under our direct control. We cannot guarantee that any email sent will be received or that the contents of the e-mail will remain confidential during internet transmission.